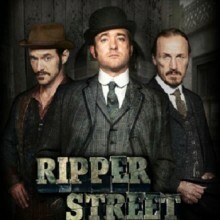 Matthew Macfadyen is back in the gripping period crime thriller ‘Ripper Street’ as Detective Inspector Edmund Reid. Jack the Ripper was a serial killer who butchered a number of women in and around the Whitechapel District of London in 1888. This drama is set about six months after the final murder, with now-peaceful East London hoping that the reign of terror is over. Among the hopeful are members of H Division, the police precinct tasked with keeping order in the district, including Detective Inspector Edmund Reid, a forward-thinking detective haunted by a past mistake that ended in tragedy. While trying to keep order in the chaotic streets of Whitechapel, Reid is soon drawn into the seedy criminal underworld of Victorian London, where each new murder elicits fear that the Ripper may be back. ‘Ripper Street’ is available via Amazon Prime Instant Video every Friday from this week! Matthew is available for voice work at the moment so give us a call if you’re after a strong, smooth RP voice then give us a shout.